Zu San Li, “Leg Three Miles”, is on the outside of the shin, just a few inches below the knee. Slide your fingertip up the outside edge of the tibia (shinbone) until you fall into a hole. It’s a large point, so trust your instincts. St-36 is deep: Press firmly! ST-36: Zu San Li will give you wings! St-36 builds energy in the body: After activating it, you supposedly “can walk another three miles.” I find it useful for treating chronic fatigue or for when you need a temporary boost on a rough day. Since it’s on the Stomach channel, it also helps aid poor digestion. It nourishes your Yin and activates your Yang. St-36 is the Ruler of the Abdomen, so it’s good for most digestive complaints. Use it to treat indigestion, constipation, diarrhea, gas, malabsorption, diabetes, etc. Note: Stimulation can increase stomach acid, so it’s great for an overfull belly, but bad for ulcers or heartburn / acid reflux. 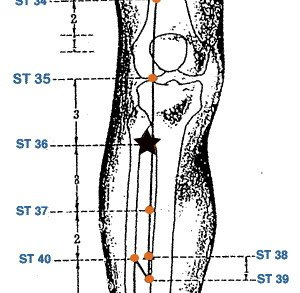 This entry was posted in Acupressure YOU can do and tagged acid, acupuncture, digestion, energy, fatigue, heartburn, vitality by Sharon Rose. Bookmark the permalink. Acupuncturist, medical massage specialist, scientist, roadtripper, historian, cat herder, gamer, belly-laugher. this site is so useful!! to schedule if you don't see a time you need, or if you have any questions. Ear seeds - Radishes for reflexology! CBD salve – New solutions for pain relief!